Where We Help Your Pets Live Longer, Healthier Lives... 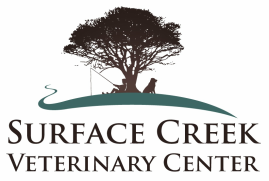 Here at Surface Creek Vet, We Are Raising Veterinary Care To a New Level! Raising animals is a journey, and we are here to help you. We treat you like family and your animals just like our own. Come visit our clinic, look around our website or call us to find out how we can help you with your animal health needs. We will get you in the same day you call for any urgent problem, guaranteed! We Are Here To Help With All Your Livestock Needs As Well! April Showers bring ... Summer Bugs! This month we are offering 20% OFF all our bug treatments! All heartworm prevention and flea and tick products are included. Stop by to stock up for the coming summer and enjoy this discount all month. Give us a call if you have any questions at 970-856-4474 or stop by today! Want to hear what other pet owners are saying about SCVC? Click here! Did you know we have a ﻿tag engraver﻿ at the office? If you want personalized dog or cat tags, we have a variety of shapes and colors to choose from. And it is done right here, you can take it home with you! ﻿Did you know we accept CareCredit? CareCredit is a credit card for healthcare expenses. You can use it at the doctor's office, the dentist, and the vet's too! If you have any questions or would like to apply, call us here at the office! Our Own Dr. Jeff, an Author! Dr. Jeff just wrote a dog food recipe book called "Cooking with Buck, Healthy Recipes for Dogs"
We are really proud of him and you can watch his interview on ABC , and if you are interested, you can pick up a copy of the book at the clinic or online. We also have a new line of diet ingredients, check it out! For your convenience, we now have home delivery of prescription medications, heartworm preventatives, other supplements and treats, and even pet food! Click on the link above to find out more or place your order. Want to get our newletters emailed to you as soon as they are out? And hear about all our specials and upcoming events? We thought so! Welcome to the family...click here to sign up! Check out this article in the DCI about the donations we were able to make with the money raised at the Dog Jog! We have a new technology to help your animals- a therapy laser!! We have been using it for a couple years now and are having great results. It's another way we are offering more options to give your pet the best care possible! On a lighter note, you can submit your general and not-so-serious questions to Dr. Jeff's Litterbox, where he will scoop once a week (note: real cat litterboxes should be scooped much more often!) to find the most malodorous nugget and share some nuggets from his own wealth of knowledge. Follow the link!